SUPERWANI: I wore an unfinished wedding dress!!! Next update, I wud like to reveal about my darkkkk secret.haha..I think only my bride's maid cud understand how disaster my baju was. FYI, we have bought the kaen 3 months before the date. I kept calling them asking for updates of my baju. Until a week before my wedding (it's on Monday), the tailor asked me about the design!! !After 3 months of discussion now she said that she cudn't remember. She blamed me for telling her so early. Sabar je la.. But I think the baju bertandang is more disastrous!She only started sewing it on Friday evening (while my wedding will be held tomorrow afternoon). So, v hv to ulang alik checking on the baju. That night we went actually to PICK UP the dress. But the dress was so briefly sewed with pins all over. Even the cutting was not according to my body. At 12am, we still didn't get the dress. The next morning, we went to fetch the dress. It was 9am. The baju looks exactly like last night even I had done the fitting last night. I saw the tailor was sewing another w-dress.I was so mad! She promised to send the dress to me at 1030 at the hall (apparently the hall is not that far from the boutique). I should be walking into the dewan at 1230pm. It was 1240 that the dress arrived. And to my shock, the dress looked exactly like last night. No ammendments made and no progression noticed. I just wore it dgn penuh kesabaran. My MUA was so angry that she has to apply like hundreds of pins so that the dress will stick well on my body. So, now you know that I was walking into the dewan with a brief sewed wedding dress!!! No words can describe how much I hate this decorator for ruining all our majlis. Hope our OP can work their magic on the photos. Oh well, yes, I did get discounts for their service cz they themselves knew how bad their service was. mysarah:ha??fb? ?waaa...sape tuh?ala my..ape2 pon kite kene redha.bende dh jadikan..but still xdela terok mane.my expectation tu je yg tggi kot..
hi queen =)... lama tak leave comment. 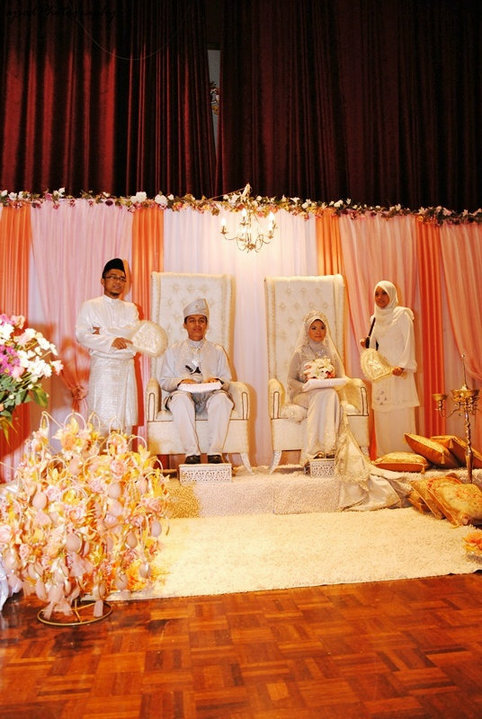 betul ckp bell, dlm pics serius tak nampak semua tu. what i see? bride with her sweet smiling face.. :)dapat bersama peneman hati katakan..hehe..
well, tak sempat nak wish u.. selamat pengantin baru. semoga penyatuan ini mendapat berkah dr Allah.. & cepat2 dapat baby yang comel! baby? ?haha..lambat lg kot..tggu balik mesia.insyaAllah..
tula maira..kite kene redha..don expect too high.and dont forget to alwiz smile.I think the smile will cover up any weakness la..cz many people pon x perasan wedding i ade byk probs. betul ckp cik belle. even though u got problems dgn baju n pelamin sume tu tp u maintain happy jek. sk:baju all designed by me.so, its custom made for me la..if happens i like then i'll pay full.tp ni x siap they get it back la. missB:=(...itula..alhamdulillah..i dh jmpe kwn2 mmg dh lupe dah jarum jemarum tu..haha..tp bile i jln jarum cicir2.haha..
seriously, ko sgt tabah wanie.. suspect aku ngan ko... bila baca psl w-planner ko ni, rasa marah sgt.. mcm mana dia blh tergamak buat org mcm ni? kepala lutut betul..
omg i baru sedar ur post ni tx to my exam preparations..ur boutique was disastrous!!! 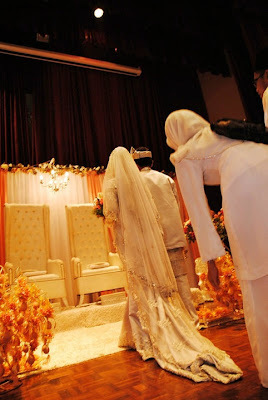 u shud go n reveal them like i do.. gile hape wat cmtu kat majlis org.. tak berkat duit tu.hamik ko!